Does Suture Removal Time Affect Root Coverage Outcome? A meta-analysis of randomized clinical trials that assessed single tooth class I or II recession defects treated surgically with a coronally advanced flap. Early (less than 10 days post-op) and late (more than 10 days post-op) suture removal were compared in terms of differences in complete root coverage outcome. Data from seventeen studies comprising of 325 single recession defects revealed a superior proportion of sites exhibiting complete root coverage when sutures where removed more than 10 days post-operatively. No significant difference in outcomes between absorbable and non-absorbable sutures when they were removed more than 10 days after surgery. 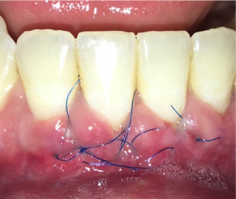 Early suture removal (less than 10 days post-op) can hinder complete root coverage outcomes in singe tooth recession defects treated with a coronally advanced flap. Modern 5-0 polypropylene sutures have excellent tensile characteristics and are comfortable enough for us to delay suture removal until at least one month post-op. This allows a mature attachment to form and increases the odds for complete root coverage.